Few foods can match the flavor and drama of Sichuan cuisine. Make it at home and you just might say goodbye to takeout forever. Here, two must-try Sichuan recipes you’ll want to make again and again. KUNG PAO CHICKEN, mapo tofu, twice-cooked pork… chances are you’ve been gobbling these Sichuan classics from takeout containers for years. Perhaps you’ve even grown addicted to the unique tingling heat of Sichuan pepper. But cooking the stuff in your own kitchen? Likely not. Not that we blame you. The exotic complexity that makes Sichuan food so irresistible is intimidating. And many of the key ingredients are borderline unrecognizable—sweet wheat paste, anyone? Pickled mustard greens? But mastering the wonders of mala—a description of Sichuan fare that translates literally to “numbingly hot”—is easier than it looks. Ingredients that used to be difficult—or impossible—to find are now easily available online. And once you get the hang of it, you’ll find that what you make yourself is far superior to the stuff you get from Szechuan Delight. China’s Sichuan province lies in the country’s remote southwest, bordering the foothills of Tibet, cut off from its neighbors by fierce rivers and forbidding mountain ranges. Its cuisine is a product of its isolation, its fecundity (nearly everything grows in the region’s temperate, well-watered climate), and regular injections of outsiders fleeing chaos elsewhere in the empire. The star of the cuisine is the mighty Sichuan pepper—which has been employed in regional cooking for thousands of years because of its unique ability to induce the numbing sensation that makes eating Sichuan such a roller-coaster ride. Indeed, there’s a paradox to cooking with Sichuan pepper: Its anesthetic effect balances out the burn of the chili pepper, which encourages cooks to add even more hot chilies. That dance of heat and relief results in something few cuisines can offer: total sensory overload. 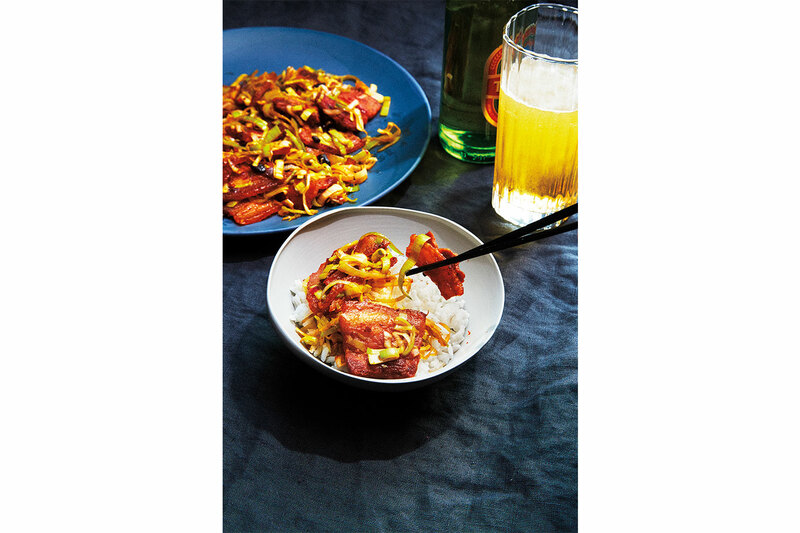 But cooking Sichuan is about more than just putting food on the table. The color, the spice, the sizzle of hot oil, the clang and rattle of stir-frying—it’s all about the drama. Your friends won’t just clamor for the food; they’ll stand captivated in your kitchen while it all happens, enraptured by the spectacle. 1. Marinate the chicken. Mix Shaoxing wine and soy sauce, add chicken, and refrigerate for 30 minutes. 2. Make the ground Sichuan pepper. Toast 11⁄2 tbsp of the whole chilies in a dry wok over medium heat, stirring frequently, about 10 minutes. Grind into powder with mortar and pestle or spice grinder. 3. Coat the chicken. Mix ground pepper, cornstarch, cayenne, and salt in a large sealable plastic bag. Remove chicken from marinade and discard marinade. Add chicken to bag, seal, and shake until pieces are lightly coated. 4. Cook the chicken. Place wok over high heat. Add oil and heat until wisps of smoke appear. Carefully add chicken, reduce heat to medium, and fry until cooked through, about 2 minutes. Remove chicken and drain on paper towels. Return oil to a high heat and add back chicken in two batches, to avoid overcrowding. Finish frying at high heat, with oil at a fast bubble, until chicken is crispy and golden brown, 1–2 minutes. Remove and drain on paper towels. 5. Finish the dish. Pour oil into a bowl and return wok to medium heat. Add back 4 tbsp oil and heat briefly. Add garlic and ginger and cook, stirring vigorously, until softened, about 1 minute. Add red pepper flakes and sesame seeds, stirring until lightly toasted, another 1–2 minutes. Add remaining whole chilies, Sichuan peppercorns, and scallion whites. Stir until fragrant. Add sugar, chicken, and scallion greens and stir-fry until well-mixed, about 2 minutes. Serve. 1. Prepare the pork belly. Bring pot of water to boil. Add pork belly, reduce heat, and simmer 20–25 minutes. Chill in refrigerator for 2 hours. Thinly slice pork into rectangles roughly 1 inch by 2 inches, about half fat, half meat. 3. Finish the dish. Push pork to one side of wok. Add hot pepper paste, wheat paste, and fermented beans and mix together. Add leeks. Stir-fry until everything is coated in sauce and leeks are slightly wilted, about 2 minutes. Serve.